Looking for a high performance yet affordable electric pump? If so, you need to check out this innovatively designed digital 12V DC Portable Compact Tire Inflator by DBPOWER. Of course there are many other air pumps in the market but if you want fast tire inflation, durability and convenience in one package, this electric bicycle pump is exactly what you need. There are many situations which necessitate a powerful tire pump; you could be suffering a flat tire emergency for your vehicle, motorbike or bicycle or probably you need to inflate a ports ball or any other inflatable in your house. In all these cases, you need a powerful electric pump which is easy to use and fast. 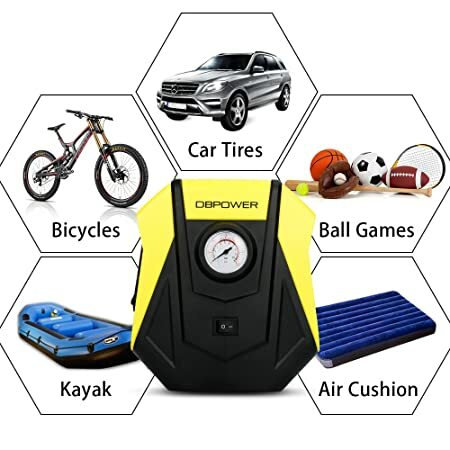 If you are looking for the best air pump for different uses in your home, you need to assess what this product by DBPOWER has to offer. This Portable Electric Auto Air Compressor Pump is a fine blend of aesthetics and function in design. It is a digital electric pump which you just need to plug into a power supply, set to required pressure level and start inflating. The automatic shut off function guarantees safety when inflating tires and also protects against damage to tires. There is a digital LCD display to help check the pressure readings and it also features a bright backlight LCD display for night use. The long power cord allows you to reach all four tires with more ease and also guarantees faster operation. The compact and ultra-durable design is not only aesthetically appealing but also assures durability of the product. Most tire pumps in the market are cumbersome to use and fall apart under the pressure of regular use but not so for this electric tire pump. The design is primed not only for fast inflation but also for convenience and durability. Long power cord: The 3m (10 feet) long power cord ads to the convenience of using this air compressor pump especially with vehicles. You can reach all four wheels easily and this saves you a lot of time. Digital LCD display: This is one of the most prominent features on this electric pump and it also features a bright backlight LCD display in case you want to use the pump at night. It is easy to read the current PSI setting and also set required PSI level. Automatic shut off function: Once the desired pressure level is reached, the device shuts off automatically. This is one of the most important features in this digital air pump and it not only enhances safety when using the compressor but also protects tires or other inflatables. Heavy duty compact design: The innovatively designed air pump is not only sturdy but also portable. It is lightweight and can be carried around by users. The compact design means there are few moving parts and this prevents damage and costly repairs or parts replacement. 3 High-air Flow Nozzles & Adaptors: These additional adapters are a big deal for customers and the product has received high ratings based on these. These allow for the use of this highly versatile compressor with cars, bikes, motorcycles, RVs, SUV and ATV tires. If you want to inflate sports equipment or any other inflatable in your home, these nozzles and adaptors make this possible. These amazing features have made this one of the top selling electric pumps in the market. For any air pump to be effective, the nozzle and valve system has to be efficient. This is exactly what you find on this portable electric pump by DBPOWER. The simple but tight nozzle and valve connection ensures no leaks during inflation which saves you a lot of time and energy. The additional 3 high-air flow nozzles and adaptors provided in the package allow for multiple use of the pump with different items. It is a small package but one which delivers enough power to get you back on the road in no time. Inflation speed is an important factor when buying a high performance tire inflator and this electric auto air compressor doesn’t disappoint. This electric pump by DBPOWER has an incredible inflation speed of 0 to 35 psi: 4.8 minutes for a standard car tire. The pump is rated at maximum pressure of 150 psi. If you are looking for a fast solution to flat tire issues, you don’t have to look any further. For just a few $ on Amazon, this is an incredible bargain for such a high performance electric pump. It is sturdy in construction which eliminates cost of repairs and parts replacement. It is also compatible with all valve systems meaning you don’t have to buy multiple pumps for different inflatables in your house. Talk of cost savings! Customers are very satisfied with this electric pump rating the digital compressor with 4.7 outof 5 stars. They really appreciate the fact that is small, light and easy to use. The DBPOWER 12V DC Portable Compact Tire Inflator is also a very practical electric bike pump. The digital LCD display is an extremely welcome feature, since it allows you to pump the tires with exactly the desired PSI, avoiding any damage to the tires. Buy it now and you will be very happy you came upon this portable tire inflator. If you can’t beat them, join them; the 12V DC Portable Compact Tire Inflator is just one of the best electric pumps you have to get for your home. It is quick and strong, automatic and easy to use, quiet, portable and compact. It is a must-have for every home and it comes in handy any time you have to inflate. BicyclePump.net Copyright © 2019. All Rights Reserved. BicyclePump.net is a participant in the Amazon Services LLC Associates Program, an affiliate advertising program designed to provide a means for sites to earn advertising fees by advertising and linking to Amazon.com. Amazon and the Amazon logo are trademarks of Amazon.com, Inc. or its affiliates.